NBC’s Peter Alexander reported on the finale of ‘American Idol’, talking with the show’s winner Jordin Sparks and runner-up Blake Lewis. Dave Karger of Entertainment Weekly also commented on Sanjaya Malakar’s performance. Video of the segment, aired Thursday (May 24), at Bing.com has since been removed. May 24, 2007 – ‘American Idol’ castoff Alaina Alexander reported on last night’s ‘Idol’ finale, where Jordin Sparks edged Blake Lewis for the title for the show’s sixth season. She also ran into Jonathan Jayne and Kenneth Swale, who were covering the finale for ‘Jimmy Kimmel Live’. Reports at CelebTV.com have since been removed. 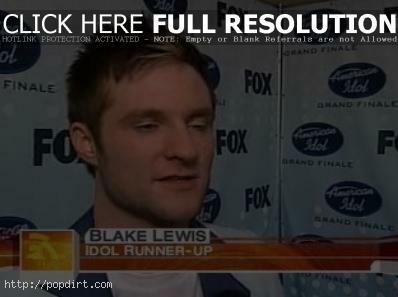 May 23, 2007 – Who will ‘Scarborough Country’ fill-in host Dan Abrams deem Tuesday night’s ‘American Idol’ winner: Jordin Sparks or Blake Lewis? Former ‘Idol’ contestant Carmen Rasmusen and celebrity journalist David Caplan cast their predictions for the finale of the hit talent show. Video of the segment at Bing.com has since been removed. May 23, 2007 – Tuesday night’s ‘American Idol’ finale featuring Jordin Sparks and Blake Lewis had most guessing Jordin would get the most votes, inheriting most of the support given to Melinda Doolittle. DialIdol.com backs that up, with Jordin’s busy rate currently at 48.9% versus Blake’s 32.1%. Bettors at Intrade are backing that idea as well, with Jordin moving up from a 75% chance of winning before the show to a current 96% chance.